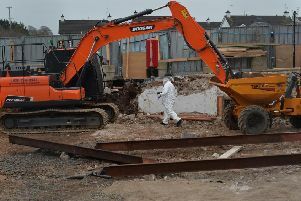 A call has gone out for safety inspections of the district’s derelict buildings after a roof collapse forced the closure of Dromore Street in Rathfriland on Thursday. Bricks and debris littered the road after the early evening incident in which the collapse left the walls of the derelict building unsafe. No-one was hurt as a result of the collapse, a “blessing” owed to a closed shop and lack of pedestrians at the time, according to concerned local councillors. PSNI and NI Fire and Rescue Service personnel attended the scene , police closing the street and advising motorists to steer clear. NIE disabled the power supply, affecting some residents in the area for a short time. Police Inspector Leslie Badger later advised that Northern Ireland Electricity and contractors were on site to make the building safe. “The roof has fallen in, making the walls unsafe,” he said. “Bricks and debris are on the road. Ulster Unionists Alderman Elizabeth Ingram and Councillor Glenn Barr have since called for safety checks to head off any potential repeat of the Rathfriland incident. In a joint statement they said: “It was a blessing the business next door to the collapsed roof was closed and that no one was walking on the footpath; otherwise, someone could have been badly injured, or worse, lost their life. “This property has been derelict now for many years and is an example of how dangerous these building can become. The two thanked local residents who raised the alarm, also police, NI Fire and Rescue, NIE and council officers for their quick response to the situation and the builder involved in making the property safer until further work can be carried out.